Dealing with the transportation needs of a large group is hassle enough, but what about when you are put in charge of moving a really large group…..a GIANT group of over 40 people? Las Vegas is home to some of the most "supersized" buildings, attractions and novelty items in the world. It is also home to the biggest limousines in the world. Giant SUV limousines are vehicles that can handle over 25 passengers. These massive machines were built to move very large groups and offer every type of amenity one could imagine putting on a vehicle. The monster 35 passenger Giant limo is cavernous inside and comes complete with club lighting, supreme sound system, wrap around seating, fully stocked bar and multiple LED TVs. It is a mini-mansion on wheels. If that's not big enough, then the humongous 45 passenger Giant limousine is available. This giant car was specially designed and customized to dwarf anything anywhere on the streets of Vegas. This 45 passenger giant limo could be described as an SUV limo meets monster party bus. You can even stand up in the passenger cabin! It has everything you could imagine in this unique limo. There are multiple TV screens, superior 5,000 watt sound system, DVD player, CD player, lots and lots of seating, light accents throughout, strobe lights, and 2 stripper poles. When you are cruising around in this giant limousine you will turn heads and make a statement. It is impossible to miss this great opportunity to charter this one of a kind masterpiece. This car is truly built for a rock star and you have the chance to make it a memorable experience for you and your friends or business colleagues. 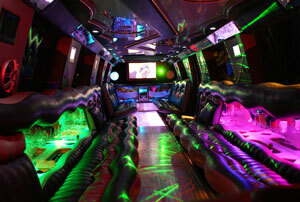 These specialty limousines require charter reservations made well in advance. 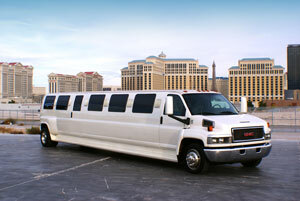 Ask a Vegas VIP representative about pricing, minimum charter length and availability.